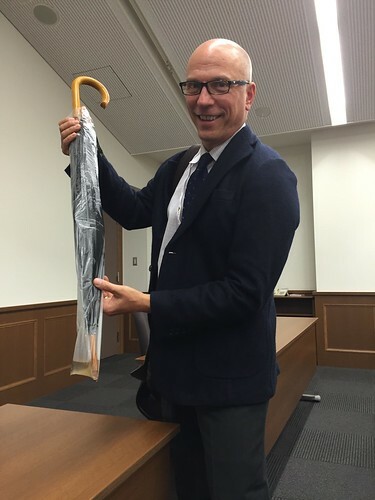 It was a dreary, rainy day today but it was lightened by the “only in Japan” umbrella sheath. 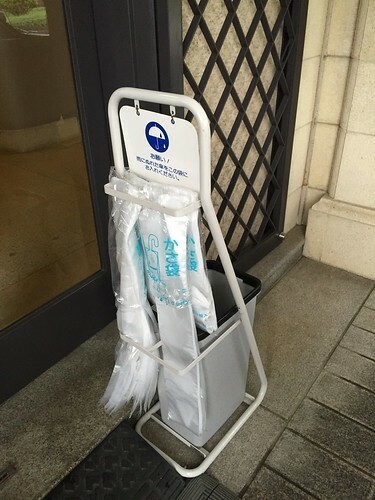 It is quite common in the entrance of buildings to find plastic wraps for umbrellas. Japanese love umbrellas and it is rare on a rainy day to see anyone without an umbrella. Women use umbrellas on sunny days as well to avoid getting a tan. As you can see in the photo above, I was surprised at how much water was on captured on the bottom of the sheath. I have a large umbrella and it was difficult to slip on the tight-fitting sheath, but I was happy not to have any leakage and keep the floor of the meeting room dry.